About the first thing I noticed after I plugged my M17 in for the first time was nasty little extraneous pulses coming out of the 'A+B+C' output. 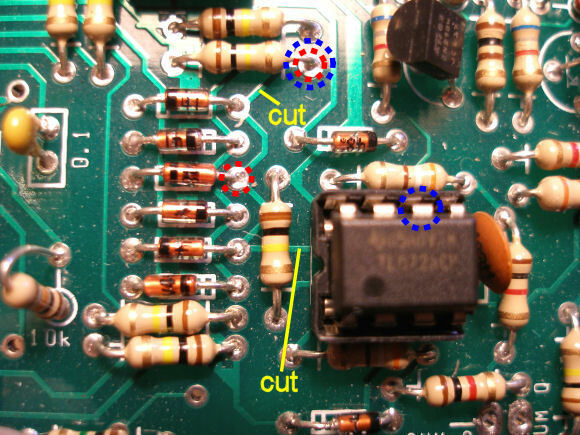 Of course, on further investigation, I discovered others had already raised this problem some years ago in the online forums; another little 'annoyance' mentioned about the module was that by allowing the threshold levels to be set all the way up to over 10V, much of the pot travel is wasted when used with smaller input signals, i.e. 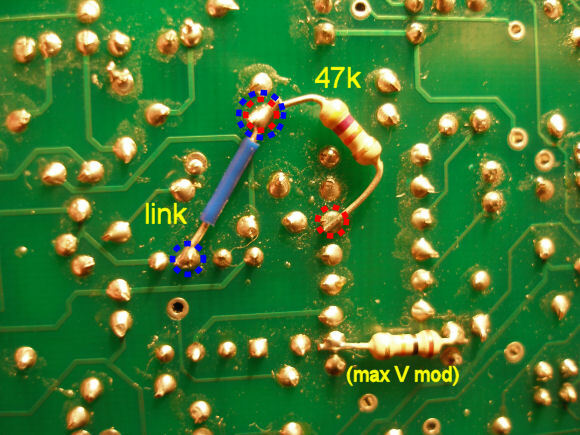 from those that max-out at around 5V, being typical of many LFOs and EGs out there. Once their causes were understood, both problems were relatively easy to overcome, and details of two simple mods are given here. Note that all that follows applies to the Rev 2.0 PCB, which is what mine is—I have no idea how different any preceding revision levels of PCB are! 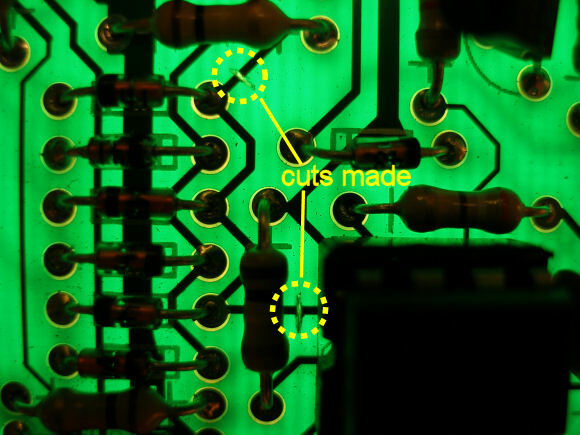 The problem is due to a design flaw in the circuit: the edges are detected and summed by an arrangement of capacitors and diodes, and this is causing the input of the op amp which generates the pulses to go below the negative supply rail, and this is causing the op amp to misbehave—the end result being the narrow spikes in the 'sum' output. The solution is to introduce a resistor which reduces the size of the voltage (it is a bit of a 'hack', but seems to work well enough). I fear there is thus a very good chance that others will have an incorrect value cap fitted in this location! There is of course a small chance that the threshold level setting is now open to noise coming in from the rails, but there are other bypass caps on the module—if anyone does this and feels the removal of the cap is causing issues, get in touch, and we can see about adding a cap in the right place! 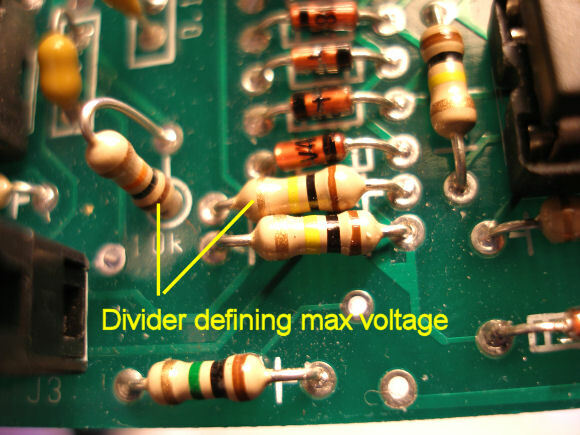 If you want slightly more or less, change one or both resistors to suit! 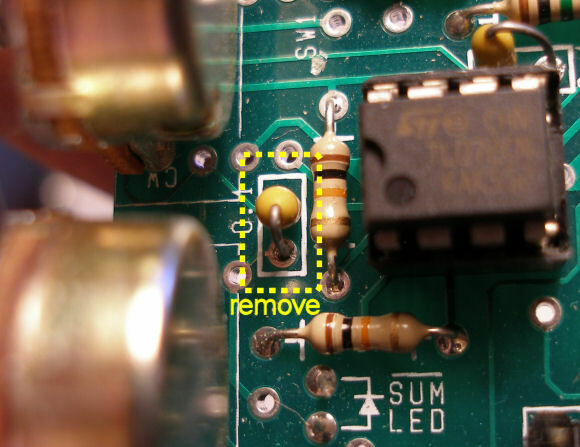 Whilst filing some of my notes on this module I spotted that I had noted that the module design apparently breaks one of the basic commandments of CMOS, 'thou shalt not leave unused CMOS inputs floating'. 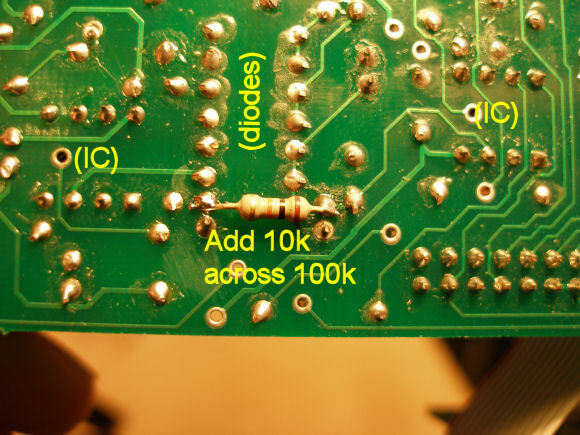 Only three of the six sections in the '4049 hex inverter chip are used, and the inputs of the three unused sections, pins 3, 5 and 7, do not appear to be tied to either ground or the supply rail. 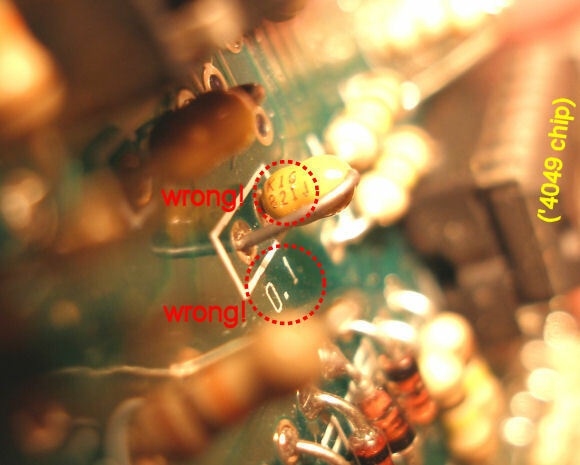 Thus if you have a module that seems to be misbehaving in an odd way, then snaking a wire down these pins, from either pin 8 (ground), or pin 1 (+12V) may be worth trying!